....in a futile attempt to get his character down. Didn't work. On the bright side, at least Archie never sicc'd Web Sheriff on anybody Boing Boing is mining some internet gold this Tuesday. ...at least there's always the Chuck E. Cheese on the corner of South First and Ben White. Video link swiped from Boing Boing. The promoters call it "Thrashfest '07", which you have to admit, is way catchier than "Festival Of Many Menacing Fonts"
Jennifer O'Connor hits Massachussetts, HARD. This weekend, I will embark upon a mini-tour (ok, it's 2 shows) in Massachussetts. First off will be the fantastic-5-band-bill-for-10-bucks PA's Lounge show on Friday August 3. (See totally awesome poster by Ian Adams above). Saturday we venture out to Martha's Vineyard to play at Aboveground Records. It's a very cool record store run by the same folks who run A Whale of a Label. 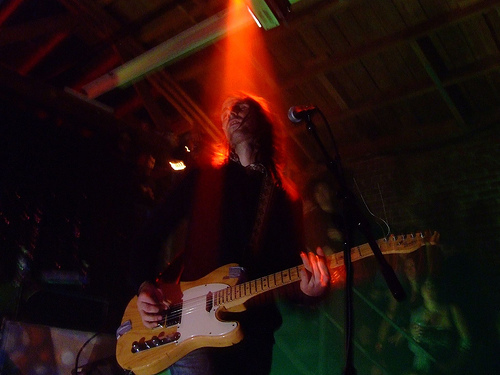 The JO'C band this weekend will be the duo of me on vox and gtr and Jon on drums. 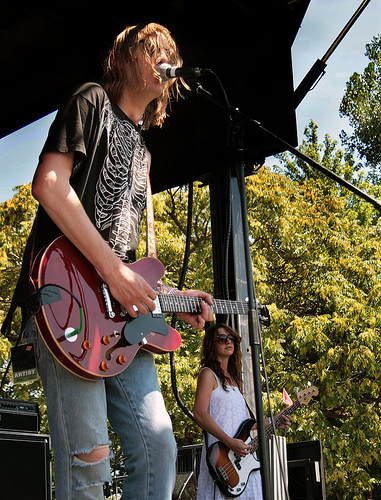 And just for fun, below is a photo of us playing at the East River Amphitheatre last weekend. Miwa took this from the very top center of the back row. Have a great week and I hope to see all you New Englanders this weekend. Smokin' TV history in more ways than one, ladies and gentleman, though with all due respect to NBC for compiling the highlights package above, there is some great stuff they missed. 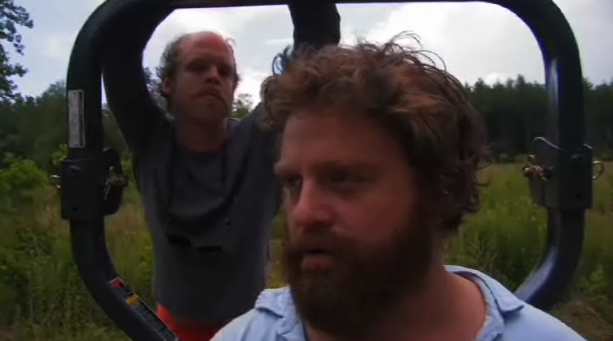 Though this isn't Matador Records & Filmworks related in the slighest, I submit you'll see few videos this year (or any other) as jarringly beard-tastic as Zach Galifianakas and Will Oldham's star turn for Kanye West's "Can't Tell Me Nothing". As killer as last Saturday night's Bowery Ballroom Ponys / Jay Reatard show was, it is pretty hard to compete with a bowling alley where the bands play right in the middle of the lanes. With that in mind I had no problem getting in the van for the trip to senic Asbury Park New Jersey. I picked up Paul Sommerstein, ESQ and we raced, Corzine style, down the Garden State Parkway to the up and coming neighborhood of Asbury Park. Once there we didn't waste too much time getting down to business on the lanes. The first game was just me and Jered and we both we're having trouble getting into the zone. Jered has a great style: launching the ball into the air at first with lots of spin on it producing a killer hook, but he just couldn't get it down and many a ball ended up in the gutter in the first game. If he had it down I'd of been done for, but my basic style prevailed. The second game brought Paul and Meslissa into the action and upped the stakes when Paul produced two awesome (and huge) home made buttons. Aerosmith and Cheap Trick, winner gets to choose their pin. Jered clearly had me beat until the 10th frame when I channelled my love of Aerosmith into two consecutive strikes. Woo-hoo! In our defense the Asbury Lanes, although totally cool, isn't really conducive to competitive bowling, but it sure was a good time. 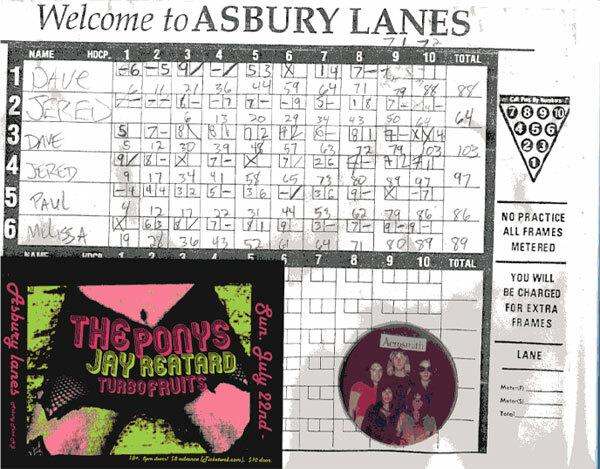 And speaking of a good time, althogh these remaining Ponys / Jay Reatard shows are not happening in bowling alleys you should by all means try to attend. Hello Matablog readers: I'm playing a FREE Venus Zine sponsored show this weekend on Saturday, July 28 at the East River Ampitheatre. That's at Cherry Street and the East River, not 23rd Street as I previously and erroneously reported on my Myspace blog. This will be a full-band style show and we'll be playing some new stuff that we are gearing up to record for the next record as well as some older jams. The show starts at 2pm and we go on around 4:30!! Government Issue vocalist John Stabb --- a longtime personal fave of at least a couple of us here in Matadorville --- was the victim of a gang attack last week, and as such, there's a benefit in the works. At the height of his creative powers, Stabb was one of the nation's more charismatic, witty front-humans, and in a just world, roving packs of teens would be vying to buy him drinks or dinner rather than nearly beating him to death. Here's wishing the Stabbster a speedy recovery. All of the October dates are supporting Spoon. When it comes to energy drinks, rock star Jon Bon Jovi thinks an East Brunswick man gives coffee a bad name. The Jersey rocker wants the owner of the Mijovi energy drink to change its name, arguing it is too similar to his famous moniker. But Marcos Carrington says his coffee-based energy drink is named after his girlfriend, whose name is Jovita. After Jon Bon Jovi, who lives in Middletown, saw a can of Mijovi for sale in a cafe in nearby Red Bank in January, his lawyers sent Carrington a letter demanding that he stop using the name Mijovi. "It is just unfair," Carrington, 37, told the Asbury Park Press for Thursday's newspapers. "It is unfair because Mijovi has nothing to do with Bon Jovi." Carrington said he started Mijovi in August 2004 as a way to raise funds for an environmental consulting business. He said there were no coffee-based energy drinks even though coffee is one of the best-selling beverages in the U.S. Working with a flavor company, he developed Mijovi, a coffee drink that contains Taurine, B-vitamins and caffeine. In a Jan. 22 letter, Los Angeles lawyer Peter Laird, representing Bon Jovi, objected to the word "Mijovi" as well as other words "itsmijovi" and "itsmilife" that appear in the company's marketing materials and on the can. 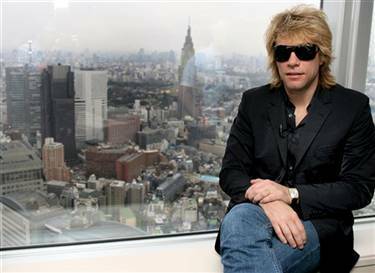 Rather than use Carrington's spelling, the letter used the phrases, "It's My Jovi" and "It's My Life." "As you should be aware, one of Bon Jovi's most popular songs is entitled "It's My Life," the letter states. "We hereby demand that you immediately cease and desist all further use of the name "Mijovi' and "It's My Life.' "
If JBJ is successful in halting sales of this (gross sounding) drink, presumably Richie Sambora will be emboldened to go after anyone selling Sambuca. Likewise, what is stopping Tico Torres from threatening action against Taco Bell? 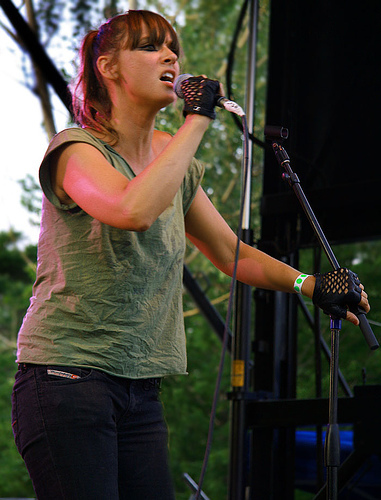 SM + Bob Nastanovich, performing a little something called "Trigger Cut", Pitchfork Fest, Sunday, 7/16. Moments before Sonic Youth took the stage Friday evening, the Union Park audience was reminded that Yoko Ono would headlining the following night. An announcement which was met with a chorus of boos. Man, talk about holding a grudge. Should be a great tour...and check out the playing partners, too. 09-14 Seattle, WA - Showbox #! 09-15 Seattle, WA - Showbox #! 09-16 Portland, OR - Crystal Ballroom #! 09-17 San Francisco, CA - Warfield Theatre #! 09-18 San Diego, CA - House of Blues #! 09-19 Los Angeles, CA - Henry Fonda Theater #! 09-28 Vancouver, British Columbia - Commodore Ballroom #! Much as I hate to call Rolling Stone's readers a bunch of chumps, they and the venerable rock journal have colluded on a poll of "The Twenty Most Annoying Songs". Suffice to say, I am confident the Matablog's readers have some more interesting choices up their sleeves. 20. Wham!, “Wake Me Up Before You Go-Go"
That's it? No "Safety Dance"? How about "Keep Your Hands To Yourself"? "We Didn't Start The Fire"? And other than a wretched sense of history, how did Stacy Q not make the cut? In honor of our esteemed GM's 21st birthday today, I am declaring this coming Saturday (July 14), an (unpaid) holiday for all Matador staff. I fully expect most of the nation's other employers to follow suit. Word of warning to you jerks in Arizona --- if you try to diss Patrick the way you did Dr. King, I can almost guarantee the Ivy Green reunion tour won't be stopping in Phoenix or Tuscon. ...but what's the environmental impact of hundreds of thousands of unsold Zunes? Surely This Isn't Chuck Scarborough's Idea Of Free Speech?